Over the 15 years that the Seattle area has allowed some camps, the arrangement has often affected the permanent residents they wound up living beside. Nowhere was that more true than at SPU. 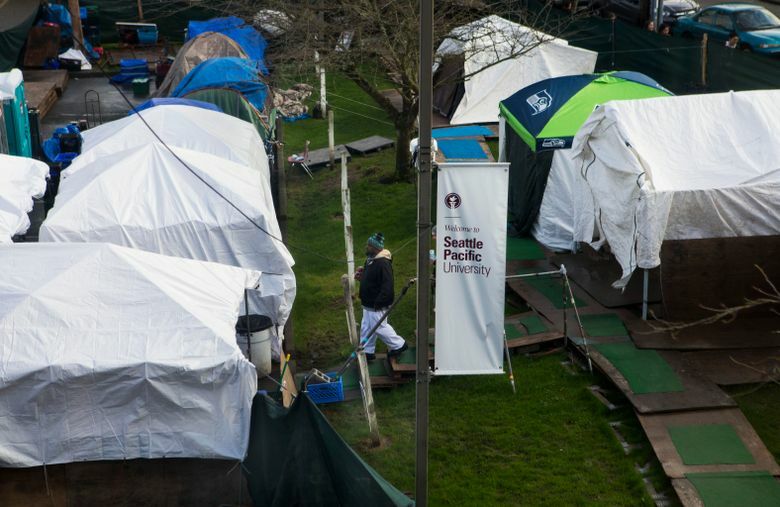 SEATTLE — For months, 65 homeless people lived in tents they set up in a parking lot behind the Seattle Pacific University bookstore, with a row of portable toilets and layers of clothes to guard against the damp chill of winter. It was a homeless camp like so many that crop up along roads and ramshackle lots in some U.S. cities, except that this one had been invited here by the university administration. So Genny Deserley, 14, who became homeless with her mother, Krissy, last year when the rent on their apartment doubled, sometimes curled up in the university library or the student union with a book on rainy afternoons. And Emma Goehle, a Seattle Pacific sophomore studying global development and sociology, spent hours meeting with people in the tent city and conducting interviews for a university research project on homelessness. Homeless encampments are bleakly familiar fixtures in cities. 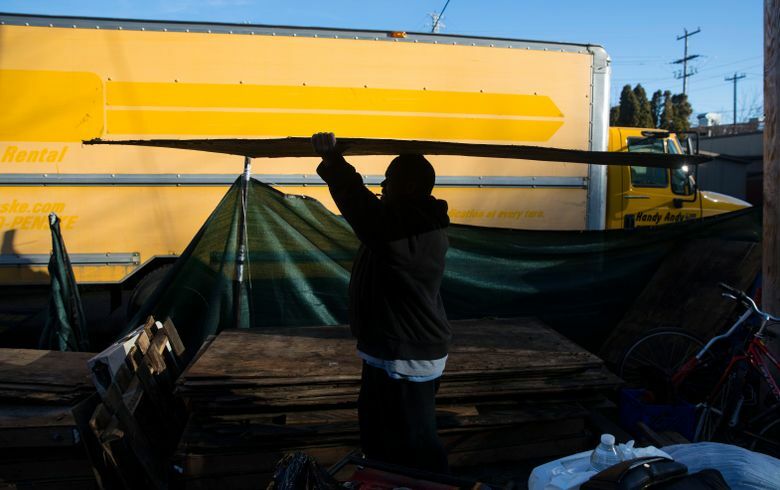 But here in the Puget Sound area of Washington state, which struggles with one of the nation’s worst homelessness problems, an unusual arrangement took root: homeless camps with rights and rules, and given government protection from the raids, sweeps and indignity of life in the shadows. Some other cities grappling with homelessness, especially on the West Coast, have set aside places to allow camps or have opted not to enforce laws on outdoor camping for periods of time. But the Seattle area went further into the experiment: It has, over the course of more than a decade, gradually allowed 11 camps to become permanent features of the landscape. This tent city in the university parking lot was orderly — it even had a front desk where visitors were expected to check in — and the arrangement generated intense conversations about homelessness across the campus. But the approved encampments also raise questions among people who say the problem needs a much larger, more permanent solution. Just a crutch, or a way back? Are the Seattle area tent cities a crutch that takes pressure off demands that government provide permanent affordable housing? Or are they true steppingstones into the mainstream, with their internally enforced rules aimed at sobriety and participation in camp security and democracy? National advocates for the homeless say much the same thing. 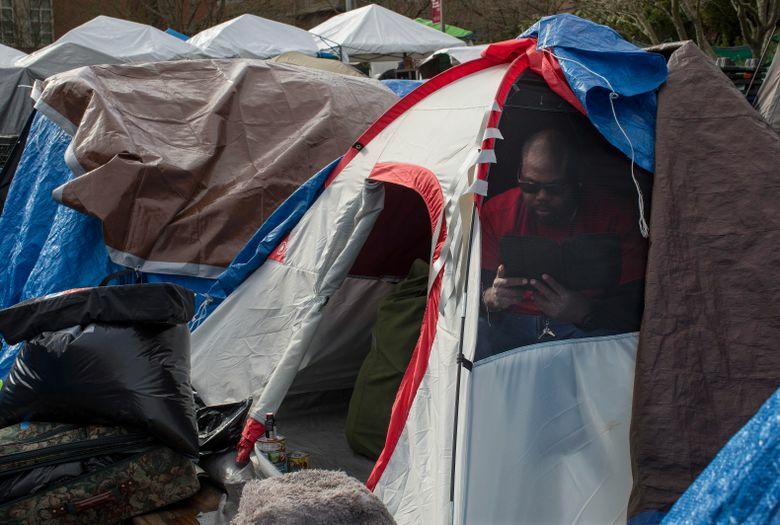 The city of Seattle helps fund some tent camps, they said, through financial or logistical support, but the city also continues practices of sweeps and evictions for unsanctioned camps that it does not want. Still, over the 15 years that the Seattle area has allowed some camps — some anchored in one place, others, like TC3, roving from host to host — the arrangement has often affected the permanent residents they wound up living beside. Nowhere was that more true than at Seattle Pacific. The idea of a university hosting the homeless at all, let alone for months, is all but unheard-of around the nation, education experts said. The university, which was founded by Free Methodist Church members in 1891, has allowed TC3 on campus for three 90-day stays over the last six years. Two other Seattle schools, the University of Washington and Seattle University, have also hosted camps. And homeless people, who in some cases come from generations of poverty, can be changed as well. “The students have become our friends,” Krissy Deserley said. She said that she and her daughter had fled an abusive relationship, and that it made her hopeful seeing Genny explore the campus and understand what education might offer. But on a religious university campus where discussions of theology and morality are part of the curriculum, interactions across the camp/campus line were complicated, too. Sally J. Clark, a former member of the Seattle City Council, said she long wrestled with the question of whether supporting sanctioned camps was an openhearted city response, or a failure that only looked good in the moment. The population of the 11 sanctioned camps fluctuates, but their total capacity of about 500 to 600 people constitutes only a small fraction of the need here. Experts say that there are more than 11,000 homeless people in the region. 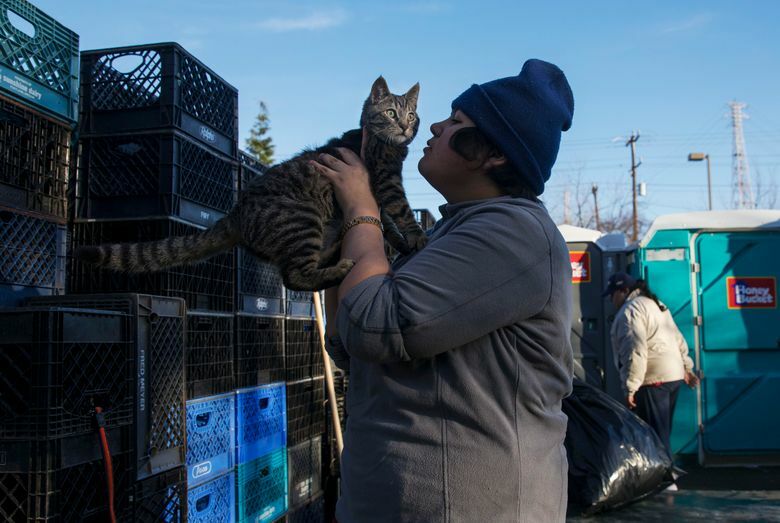 Some say the sanctioned camps have created something of a hierarchy among the homeless, between people in the permitted tent cities and those in camps deemed illegal. Inside TC3, alcohol or drug intoxication, violence, or failure to work volunteer security shifts can get residents banished by camp leaders, one of the relatively elaborate camp rules that cover 14 pages. Still, sometimes there is no clear path. Last fall, when Micailah Moore, a 20-year-old sociology major, arrived in the camp for an interview with a resident who was living there with his 6-year-old daughter, she found that the father had taken ill and was headed by ambulance to the hospital. He pleaded with Moore: Could she drive his daughter there and meet them? She immediately said yes, but on the way, became unsure about the ethics and liability at issue. She knew that her professors were having a meeting that day in a nearby doughnut shop, so she pulled over and ran in. “I said, ‘What do I do?’ ” Moore said. The situation was soon resolved. The little girl got a doughnut and was reunited with her father, who recovered from what turned out to be food poisoning. But a bigger problem, Moore said, emerged more gradually, as she spent more time in the camp. She was raised Baptist in North Carolina, the daughter of a pastor. But now, she said, she was identifying with members of the tent camp and beginning to have questions about her faith. Patricia Malone, 57, a TC3 resident who has been through four moves now, leaned against a stack of boxes as the camp broke down at Seattle Pacific University on a recent Saturday morning. Malone spent 40 years waiting tables, which she said took a toll on her back and legs. She came to Seattle in 2012 seeking better medical care and has been homeless on and off since. 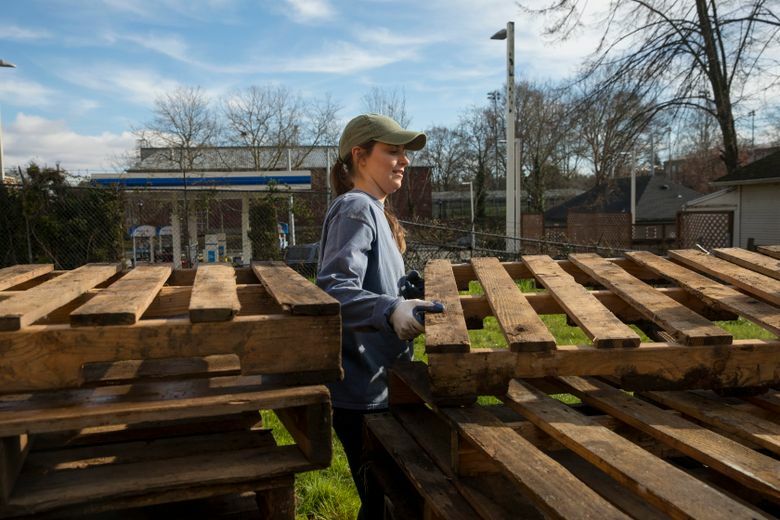 Around her, student volunteers were helping to load the trucks for the camp’s next home — a grassy lot owned by a small Baptist church across town. “Hard, and getting harder,” Malone said, of life on the move.